Charly and Eric are from a French and Russian family that has been in show business since the 1500s. Several of them still live in Paris near the Moulin Rouge. Charly joined his brothers in helping to bring create the first and many shows at Seattle’s Teatro Zinzanni and his son Eric has followed that family tradition of joining skill to comedy. We are so lucky to have them together at the Moisture Festival this year. We have no idea what they will present but we already know that we’ll love it. Charly was born in the heart of Paris to the fifth generation of his family in show business. Charly and his brothers Toly and Eddy make up the acrobatic trio Les Castors which has entertained audiences around the world and across decades. From Monte Carlo to the studios of The Ed Sullivan show, the Lido of Paris to Hong Kong, Charly and his family, who live near the Moulin Rouge in Paris, have made huge contributions to the renaissance of vaudeville. 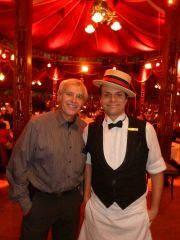 In Seattle and San Francisco, Charly has been involved with Teatro ZinZanni since its inception.